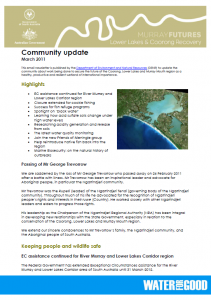 This email newsletter is published by the Department of Environment and Natural Resources (DENR) to update the community about work being done to secure the future of the Coorong, Lower Lakes and Murray Mouth region as a healthy, productive and resilient wetland of international importance. This entry was posted in Meningie, Milang, Newsletters. Bookmark the permalink.